With the risk of being accused of being a male chauvinist, I would say this is very female avant-garde jazz, not only by the pink color on the album cover, but also by the subtlety and fragility of the music. 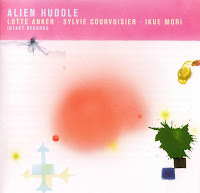 Lotte Anker is a Danish saxophonist, mainly trained in jazz, Sylvie Courvoisier a Swiss pianist, mainly trained in classical music, Ikue Mori is a Japanese drum machine specialist, now a real-time electronic laptop music wizard. On "Alien Huddle", the trio brings highly unusual music, giving impressions of birds, not as such, but in their natural environment: sparrows, owls, herons, swan, rooster, raven, crow, ostrich, blackbird, yet without being too literal in the evocation, or too programmatic in the performance. While on many tracks Courvoisier and Mori create short, rustling, shuffling, bleepy or thundering sounds, with Courvoisier more often plucking her strings directly than using her keys, the fact that the sax's performance stretches the notes, gives a quite accessible (relatively speaking) feel to the music, almost redefining the rhythm section for modern music and its interplay with a solo instrument. The interactions are organic, immediate, full of surprises and wild thought jumps. Despite the similarity of approach throughout the album, each track has its own coherence and unique identity. The music is unusual, but it has an intense and highly concentrated beauty. Israeli tenor saxophonist Albert Beger can be fierce, and also very gentle, yet he's always expansive. He appears to be influenced by both Coltrane and Ayler, at times sounding like Redman. His new quartet further consists of Aviran Ben Naim on piano, Gabriel Meir on bass and Yoav Zohar on drums. In contrast to his trios with William Parker and Hamid Drake, the addition of the piano brings the music more into post-bop territory, with a lyricism and emotional outbursts which will surely please the fans of Jarrett's early 80s quartets, with sax and piano having changed the lead role, of course. And even the more mainstream, more composed tracks such as "Tales Of Beelzebub", quickly evolve into very powerful improvisations by sax and piano, pushed forward by a strong rhythm section, ending in abrupt stop-and-go unison breaks. "Point Of No Return" is a heartrending duet for sax and piano. 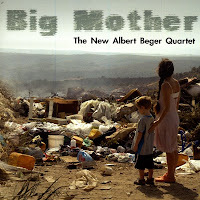 "Big Mother" refers to nature and mother earth, as an ode and a lament about the deterioration of the planet, as illustrated by the sad album cover on which a mother and child look at a waste dump. The march-like cadence of the track gives the inevitability of progress, or vaguely reminiscent of the Sorcerer's Apprentice in Disney's Fantasia, over which first the arco bass, then a mournful sax wails and weeps. Yet the last track "The One For Hope", shows some light at the end of the tunnel, although starting very sad, with a very loose structure and rhythm, gradually moving to a more light-footed approach, especially because of the piano's high-toned playing and Beger's soaring sax, leading to a gentle composed ending. A strong achievement. It's a place that we all know too well. And saw a peaceful valley turn to hell". After the trumpet, the sax takes over, creating a little lighter mood at first, but when the rest of the band joins, full distress and despair ensues, with horns blowing in all directions, drums thudding and bass pounding, suddenly stopping for sparse guitar sounds and a wailing blues trumpet, for an even slower and sadder mood, heartbreaking as can be. If anything, it makes me think of Charlie Haden's "The Ballad Of The Fallen" in its grand sweeping theatrical display of sympathy with the underdog against the one in power, integrating all musical styles possible to demonstrate the universality of the theme, yet at the same time using the expressive elements that make these styles great and turning them into one big piece of an auditive story, the drama of mankind, but then compressed, condensed into half an hour of musical delight. 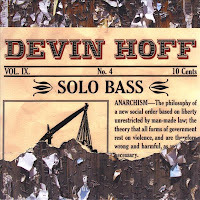 Devin Hoff is one of those modern bass-players with a very broad pallette. You can't call him mainstream, you can't call him avant-garde either, yet he's equally comfortable in both and everything in between. He has played with amongst others Nels Cline, Plays Monk, Steven Bernstein, Good For Cows and Ben Goldberg, all musicians open to any style and adventure. Furthermore he gives musical references as wide apart as "Munir Bashir, Joao Gilberto, Lightnin' Hopkins, and Joelle Leandre, as well as the profound inspirations of Ornette Coleman, The Carter Family and Black Sabbath". All that by itself gives a good indication of his approach to solo bass : it's accessible, creative, and sophisticated. The titles are all a little bit anarchic, but that's certainly not what you would expect from hearing the pieces. True, sometimes his bowing leads to some hair-raising sounds, but it is always complemented by his soft plucking. Playing solo bass is extremely difficult, not by itself but to keep the listener's attention throughout the whole album. And Devin Hoff tries to vary sufficiently in style, tempo and pizzi vs arco, to maintain interest. I have Paul Roger's "Being" still fresh in the back of my head as the reference for solo bass, and that's a tough comparison. Rogers indeed manages to throw his entire "being" into his music, showing the emotional nakedness of true authenticity, an incredible feat well beyond most musicians. That being said, Hoff's bass playing is very good, his approach to music is nice. And I just love the sound of solo bass, the warmth and the depth of the instrument : it is clear that Hoff enjoys every atom of his instrument and every sound it can make. So do I.
I find it amazing that musicians who are extremely talented and have earned their reputation in mainstream jazz and big bands, create music that is totally different and avant-garde when leading their own ensembles or when playing solo. Trumpeters like Herb Robertson, Thomas Heberer and Axel Dörner fall into that category, and so does Australian trumpeter Scott Tinkler. 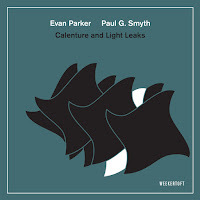 In the 1990s he already released several trumpet trio recordings, which are truly great : adventurous and accessible at the same time (and downloadable via eMusic). 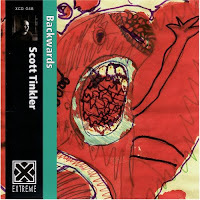 On "Backwards", his overdubbed solo recording, he pushes the boundaries of trumpet playing, not as far as Greg Kelley or Nate Wooley, still paying attention to the lyrical side of things, the expressivity and the pleasure of creating sound, rather than just extending techniques for the sake of it (even more stunning : this record does NOT contain any overdubbing, see Scott Tinkler's comment on this post : it is mindboggling then how he manages to sound like two trumpets playing at the same time, especially on the first track!). 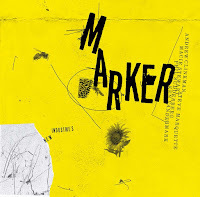 Tinkler creates an incredible intensity just by playing his horn in unfamiliar regions, sounding at the same time deeply primitive, alternating just two stretched notes fully of agony, incredibly spiritual, and very avant-garde (blowing in water as Rob Mazurek already did, but here luckily only on one track!). In that sense he is closer in spirit to the Norwegians Eivind Aarset and Per Jørgensen : deep-rooted and universal emotional expressiveness prevails over technique. If you're a trumpeter, don't miss this. If you're not a trumpeter, look for it. 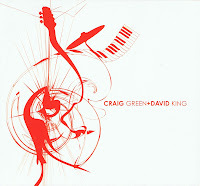 Throwing away all preconceived notions, creating new musical environments, while still sounding familiar and even groove at times, is an unusual combination, yet guitarist Craig Green and drummer Dave King, who also plays keyboards, do exactly that. The guitarist I didn't know, but of course Dave King is the highly energetic and rock-influenced drummer of The Bad Plus and Happy Apple, two bands who've rejuvenated jazz in the past decade and created interest in jazz among a younger audience. This record is not likely to achieve this, therefore it is a little bit too avant-garde for that, but then again ... the twelve tracks each create their own musical universe, sometimes utterly bizarre, but at times combining known elements into surprising new approaches. For instance, on "Walk Left", King plays piano in a totally irregular way, changing the rhythms all the time, and totally dissonant, while Green plays around this, only to fall into a repeated pattern at the end, becoming even a little sentimental and sweet. "Faux Hawk" brings a steady rock groove of some serious drumming and heavyly distorted guitar. "Cinematic" starts with eery electronic landscaping, evolving into wall-of-noise electric guitar sounds. "Praise The Shadows" brings harsh guitar sounds over distant hypnotic polyrhythmics. "Rainey Qunceira" is a track of beautiful, melodic acoustic guitar with King on vibes, again nice and sweet. But once you're accustomed to this pleasant tune, you're pushed into darkness again with "Snow Plow", on which a steady drone and brushed drumming create the backdrop for splinters and shards of guitar sounds, and surprisingly the record ends again with soft acoustic guitar over a steady almost industrial drum beat in the background. Both musicians manage to create a wide variety of musical approaches to the art of the duo, integrating all styles and subgenres they master, while inventing many more possibilities. Interestingly enough, despite the wide variety of angles, it still sounds very coherent. Sounds promising. Listen and buy from Long Song Records. Finnish power jazz guitarist Raoul Björkenheim asked (begged?) the organizers of the DMG festival in December 2006 to let him perform with Hamid Drake and William Parker, and wouldn't that indeed be any soloist's dream? For Björkenheim it became a reality and to great effect. Björkenheim has a tendency to be totally "out there", in very adventurous regions, but here he moves a little more to the middle of the spectrum (although that's very relative), without relinquishing his powerful and highly energetic playing, while Parker and Drake again demonstrate that no style or approach is alien to them and they adapt with verve and spirit. Next to his guitar he also switches once in a while to his electric viola da gamba, bowing the strings, inviting Parker to join for almost electronic sounding weirdness, but as surprisingly, there are even moments when he plays it clean, without any pedals or other distorted sounds. Björkenheim's music is as usual not restricted to any style or genre : there is jazz to be heard, blues, but it mostly sounds like a rock guitar jam session, with lots of energy, ever moving forward, with no respect or memory of previously played themes or phrases, ever moving forward without looking back, playing notes in the moment itself, coming up with new ideas, delivering them and on we go to other places. Even in this kind of environment, Parker feels perfectly at ease, making his bass sound the natural partner of this wild guitar, while Drake again amazes me with his unbelievable skill of sounding almost fluent and relaxed while playing hard-hitting high energy rock-influenced beats. 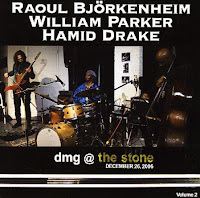 On the last track, the roles are reversed, with William Parker playing shawm, a reed instrument, and Björkenheim taking over the bass part on the lower strings of his guitar, playing a rock-influenced vamp, with Drake playing up a storm in the background. In short, it's the high quality equivalent of three youngsters having fun with improvising. The lack of focus is easily counterbalanced by the apparent fun, discipline and musical immediacy. Baltimore-based Japanese pianist Nobu Stowe is a man of many voices. His lyricism combined with a sense of adventure that were so apparent on his highly recommended previous albums, make way here for an ode to music, and more specifically an ode to Keith Jarrett. Like Jarrett, Stowe sits down at the piano and starts improvising, creating instant melodies and rhythms, often mid-tempo hypnotic pieces, with a musical intensity that comes and goes, like waves, often open-ended, but always integrated. The album's title, "An Die Musik", refers to one of Schubert's "lieder", for solo voice and piano, dating from 1817 in which he sings his love for music. Here the pianist is accompanied by Alan Munshower on drums and Badal Roy on tabla in for duo and trio settings. Badal Roy has one solo tabla piece. Both percussionists keep the tension high and participate in creating the necessary contrast and perspective to Stowe's improvising. On some tracks, as on "Trio II", Badal Roy plays even a very dominant role in setting the scene. Some of the tracks, such as "Duo IV" and the long "Trio III" create melodies that would have many listeners confusing Stowe with Jarrett at first hearing. That means a lot of impressionistic romanticism, and a search for aesthetic beauty. This is surely not the first tribute to the music of Jarrett, but it's certainly one of the better ones. On the other hand, I do prefer Stowe in a more adventurous environment. He has more creative qualities than imitating the master. 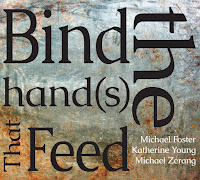 That being said, it is a beautiful album of an accessibility that is rare on this blog, but so what? I also was to a great extent sucked into the world of jazz by listening to Jarrett, and I share with Nobu Stowe the love for cats : they're independent, unpredictable, elegant and a little mysterious animals, qualities that I admire in good music. The last track on the album is dedicated to his own cat "Pochi". For sure, Stowe's music is unpredictable too, and pretty independent. 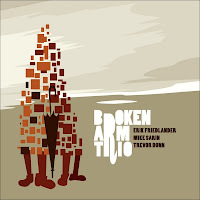 In the Broken Arm Trio Erik Friedlander on cello, Mike Sarin on drums and Trevor Dunn on bass, join forces for a nice, light-footed and warm-hearted record of unpretentious yet sophisticated and captivating music. It is jazz, at times with a few klezmer influences, but barely, with Friedlander mostly plucking his strings. He can only be heard bowing on a few exceptions such as on "Pearls" or "Ink", with especially the latter track adding some gravity and variation. 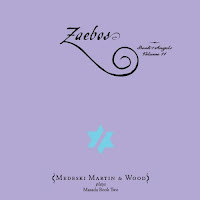 This gives the whole a sense of lightness and fun, in great contrast to the melancholy sound of the bowed instrument. Most tracks are uptempo, which gives the rhythm section the chance to shine. The music is inspired by Oscar Pettiford and influenced by the small group feel of Herbie Nichols. Friedlander, Dunn and Sarin have all three already ventured into very avant-garde environments, integrating influences from modern classical music to rock and klezmer, on top of their own creativity and adventurousness, and it is actually great to hear them here in a more traditional jazz setting. The love of melody, rhythm, jazz and interplay just drips off every note. Three great musicians having fun with music. A treat! True, it's getting out of hand, all these excessively abundant CD boxes of modern jazz bands. It started, surprisingly, but then also not, with a 12-CD box for the Vandermark 5. This leads to the reviewer's dilemma : before you have listened to all CDs, and again, and again, ... sufficiently to form an opinion and give some advice to potentially interested listeners, the year has passed and the news value of the review has become nil. So you write nothing about it, despite its musical value. Or you write about it, knowing that you haven't had time to properly appreciate (or hate) the album. Recently, in a wave of total commercial madness, Ayler Records started releasing boxes with everything-that-was-ever-recorded-by-a-musician-but-that-no-other-label-had-the-guts-to-release. The first in the row was the Jeffrey Hayden Shurdut box. The second is this François Carrier box. The regular readers of this blog will in the meantime know that I have a very high esteem for François Carrier, not only as a saxophonist, but also for his musical vision and sense of spiritual adventure. So, I do not want to make the same mistake as with the Vandermark 5 "Alchemia" box (get it, each of the twelve discs is worth having). 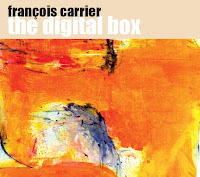 So, about the François Carrier box, to which I have only listened once ... Enough to form an opinion? Probably not. Enough to generate interest among the potentially interested? Surely! The problems with boxes is that they are not very discriminating : they kind of accept all performances on an equal footing, regardless of inspiration, delivery or sound quality. Often a little more selectiveness would be good for the listener, but on the other hand, the tastes and pleasures of listeners are so personal that opinions will diverge largely on what is good and what is not. CD-1 - Great Love, with Dewey Redman, Ron Séguin on bass and Michel Lambert on drums. Dewey Redman only performs on one of the tracks, but he is absolutey great, the way we like him. Warm-toned, creative, shouting through his horn, combining pleasure and pain in a Coltrane-influenced yet also in his own personal style. We dearly miss him. And it's great to hear him again. Kudos also to the rest of the band for the great performance. CD-3 - Far North, with Michel Lambert on drums and Pierre Côté on bass. Quite good. The bass adds warmth and pulse, the longer tracks offer great room and space for expansive soloing. Carrier is very Coltrane-like in his approach to music : spiritual and earthly at the same time, rhythmic and lyrical (although a little less exuberant, more meditative). CD 4 - Kala, with Michel Lambert and Pierre Côté : absolutely excellent, beautiful, inspired, lyrical, deep, spiritual. If you only want one disc out of the seven, choose this one. In my eyes a five star quotation. CD-5 - Unfolded, with Michel Lambert. Again a live duo setting. The tracks are shorter, leading to more focused playing and quite some intensity at times. Lambert is as important as Carrier in delivering the goods, knowing what to play, how to push the saxophonist forward, when to play, and when to stop playing. The music is excellent. If you want a second CD from the box, choose this one. CD-6 - Soulful South, Part 1, with Sonny Greenwich on guitar, Michel Lambert on drums, Michel Donato on bass. A great try-out, but with insufficient results, insufficient coherence and focus. Somehow it just doesn't match and the recording quality is not ideal. CD-7 Soulful South, Part 2, with the same band. Sound quality is a little better, the sax trio sounds great, the guitar is a little more integrated than on album six, and it works well now, with the sax defining the atmosphere and thematic developments. On the last track the guitar takes the lead, and I'm sorry to say it, but it does not lead to great music. Drum and bass try to follow as well as possible, but nothing really worthwhile emerges, even not when Carrier enters the tune halfway the track. I love Carrier's musical approach and playing. And if you don't know his music, there are better CDs to start with (look for them in my "Overview Of All CD Reviews"), but if you like small ensemble jazz and lyrical creativity, this one is worth downloading. And I apologize beforehand for the superficial listening and review. Louis Guarino Jr. was, to be honest, unknown to me until he sent me an e-mail with a link to some of his music samples. The quite clear musical references to Miles Davis electric period, but then moved into a more spiritual, more meditative context, immediately stirred my attention, and indeed, the music is better than the samples. Guarino is a trumpeter by education, but he adds synthesizer, piano and percussion programming to his credits. 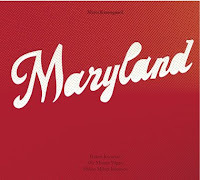 He is joined on this album by Michael Gregory on bass, guitar and vocals (on 1 track), Jesse Hameen on electronic drums and Herb Wilson on Tenor Saxophone. 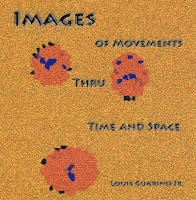 As for the rest - production, engineering, art work - all is by Lou Guarino himself, a sufficient illustration, not of the musician's skills in all these matters, but of the poor publishing environment for today's musicians. The music itself is good, influenced by Miles and Wadada Leo Smith, with long piercing and emotive trumpet playing over an irregular yet pulsing rhythmic environment, with the synth adding drama and the right accentuation, and the sax adding an extra dimension, although the trumpet is at the absolute center of the entire disc. True, the references are too obvious and the originality suffers a little from it, but the delivery and the authenticity of the performance are really great. The best tracks are the ones with the full band, as on the 17 minute long "In The Shadow Of Paradox". The solo piece "Sahara's Secrete Spaces", has a little less substance, and the vocals on "The Cycle Continues" are really not to my taste, even if they add a new dimension to Guarino's counterpoint muted playing. In short, the trumpet playing is great, most of the music is too, but unfortunately not for the entire record. Many moments of pure listening pleasure, though. 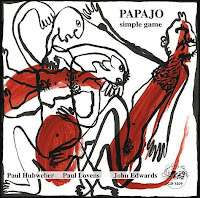 An album of pure improvisation by three reputed musicians of the avant-garde scene : Paul Hubweber on trombone, Paul Lovens on drums and John Edwards on double bass. In contrast to many avant-garde music, this one is a good illustration of restrained freedom : there is no rhythm or melody or structure to speak of, but the collaborative effort of rapidly interacting snippets of sound, challenging each other and moving on, is extremely well done. The approach is absolutely minimalistic, with the three musicians extracting even the tiniest of sounds out of their instruments, but to maximal effect. Imagine a canvas with little dots of paint here and there, without specific order, but each dot is nice, and the little dots work well together in this otherwise totally open universe, and sometimes these dots of sound seem a little surprised they exist, yet they seem to enjoy it. There are some intense moments too, when the three musicians interact in nervous and agitated conversation, without alienating listeners (at least not this listener). This is certainly no background music, but music requiring concentrated attention, and an almost zen-like state of mind. Don't resist it. Just let it happen to you. Yo, Miles! 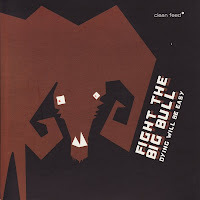 is the Miles Davis tribute band led by Henry Kaiser and Wadada Leo Smith. Their "Sky Garden" and "Upriver", both released on Cuneiform, are highly recommended for fans of the electric Miles period. Browsing the internet, I came across this free download of their Fillmore East concert in 1999. High energy playing throughout and good sound quality for a free live recording. Old news to some of you probably, but I hope that I can make a few others happy. Bassist Stephane Furic Leibovici composed 11 pieces of modern music, which he calls organic music, growing from its own essence, and that have almost not repetitive motifs, yet each track is always recognizable as the same piece. To make it even more organic, the pieces all flow almost without exception over into one another. Chris Cheek on tenor and soprano, and Chris Speed on clarinet manage to make this music even more sublime, both playing with unbelievable tonal clarity, and wonderful improvisational focus. And although Stephane Furic Leibovici's compositions are already conceptually strong on their own, in the hands of lesser musicians, they would not have come to the same high level of sophistication and "free precision". The title "Jugendstil" refers to the architectural style of the early 20th Century and the music is indeed a perfect mirror image of it : non-linear, highly stylized, crafty and refined (although the composer says he's "not interested in styles. What I am after is substance"). I searched the internet for more background information on Stephane Furic Leibovici, but I found nothing apart from some few references to this CD. Apparently he withdrew all information on himself from his website, as a way to begin again. The liner notes add : "His starting point, here and elsewhere: 'to be gentle with the sounds, they have a life of their own, to listen and to let them come to me. I don't push them around. I listen to the inside of them'". A great description of this fragile and sensitive music. 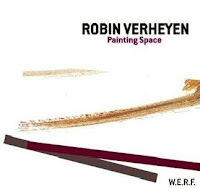 The young Belgian (but New York-based) saxophonist Robin Verheyen brings his sophomore CD with "Painting Space", accompanied by Bill Carrothers on piano, Remi Vignolo on bass and Dré Pallemaerts on drums. The central idea of the album seems to be how empty space can be filled with sound, and - as importantly - not be filled. Verheyen is a master of tone and shades of sound on his sax, subtle and nuanced, and the other musicians follow suit, with Carrothers playing lyrically and often plucking his piano-strings to great effect, Pallemaerts great as usual and Vignolo a discovery as a warm and lyrical bassist. And that's the major success of the record : the tight and cohesive sound that the band creates, and not surprisingly, more than half the tracks are penned by the four band members together. Some pieces are ethereal, meditative at times, as "Painting Space" and even more so "Wherever The Path Leads You" or "Colors In Space", others are more abstract and intense, yet always controlled and within the range of what you could call "accessible". Carrother's "Voice Of The People" is the most beautiful composition, built around a single tonal center played by the bass, over which Verheyen's soprano soars freely and calmly. The best and most impactful tracks are the ones in which a more daring attitude is shown, as on "Facing East", "Open To Love" and "Metal Bar". There is one element, though, which unfortunately disrupts the album's overall sense of unity, and that is their take on Wayne Shorter's "Capricorn", which is stylistically too different to fit here. Verheyen has tremendous skills and a wonderful approach to music. I hope he would move even more into more daring regions so that he can unleash more of his highly promising potential. Alto saxophonist Rudresh Mahanthappa had already integrated Indian melodies and rhythmic patterns in his jazz records, but on this album he takes the concept into full-fledged fusion, creating a band with both American and Indian musicians, to create a wonderful mix of really integrated genres and stellar musicianship. The ensemble consists of Rez Abbasi on guitar and sitar, A. Kanya Kumari on violin, Kadri Gopalnath als on alto saxophone, Carlo DeRosa on acoustic bass, Poovalur Sriji on mridangam and Royal Hartigan on drums. The compositions are structurally extremely strong, full of rhythm changes, long melodic lines, counterpoint by the other sax or the violin, ... There are moments when the early Mahavishnu Orchestra comes to mind, especially because of the speed of some unison phrases, as the combination of guitar and violin (as on "Ganesha" which has some chord changes which are typical Mahavishnu), at other times the approach is less fusion and more traditional tribal, as on "Snake", which evolves into an almost hypnotic dance with the soloists twirling around each other in a maddening tempo, sometimes it's meditative, closer to classical Indian music, especially on the "alap" tracks, on which each time one instrument plays solo, with "Kadri-Alap" and "Kanya-Alap" as the highlights. At times the melodies verge on the border of sentimentalism, but that is luckily more exception than the rule. And the album ends with "Convergence", a wonderful mix of genres, themes, tempi and instrumentation, with each of the musicians getting ample time for soloing, ending with a wonderful improvised sax dialogue between Gopalnath and Mahanthappa, and well, yes, actually "converging" into unison at the end (sorry to have revealed that surprise!). I am not usually a fusion fan (sorry, Rudresh, to use the "F-word" again), but this album is absolutely excellent. All musicians are excellent, the compositions are excellent, with variation and depth. Mahanthappa's sax-playing is a pleasure to hear, and his idea to join forces with Kadri Gopalnath was brilliant. 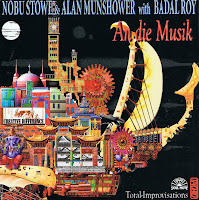 The former is without a doubt one of the most creative and lyrical sax-players in modern jazz, and the latter plays sax bending the notes, creating that gliding effect between notes that is so typical of the Indian violin and sitar. I'm not sure how he does that, but it sounds great. If you like world jazz, this one is not to be missed. Listen and download from Pi Recordings. Listen and watch this clip with some music from the album with an interview of Mahanthappa. 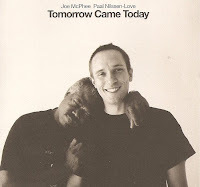 I do not usually boast about my CD collection, but I have over 50 CDs with Joe McPhee as a leader, and with reason. When I tell other jazz fans that I think he's one of the true jazz greats of all times, I often get a frown in reaction. The reason why I think that, is because his music is universal and authentic, in a deep emotional and spiritual sense, open to any influence while still remaining uncompromising in its exploratory nature. He brings a purity of approach while combining sensitivity and warmth, with powerful violent outbursts and musical adventure. And he can play with many different kind of musicians and still build rapport. 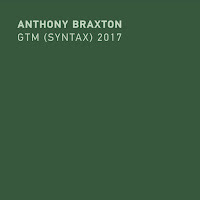 This record is his fourth sax/drums duet, after "Emancipation Proclamation" with Hamid Drake, "A Parallax View" with Paul Hession and "Voices : Ten Improvisations" with John Heward. Now, with Norwegian drummer Paal Nilssen-Love, the result of the dialogue is at the same high level. 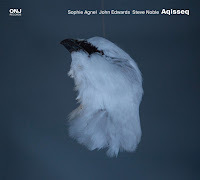 The 34 year old drummer is not in the least inhibited by playing with the 68 year old saxophonist, and to McPhee's credit, he lets the young drummer have the same level of space as he did on the duet with Hamid Drake. 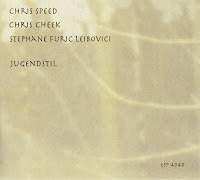 There is great respect and mutual encouragement, as already testified by the first track, on which McPhee blows a very mournful slow tune, which incites Nilssen-Love to accentuate with little cymbal sounds, or the opposite, double the tempo for some high energy playing without creating a conflict. The second track starts with high energy drumming, inviting McPhee for improvising with the same intensity, and he does that by playing highly rhythmic bursts of sounds circling around the same tonal center, meeting the drums halfway, almost letting go of the sax as a lyrical instrument. On "Ibsen's Ghost", McPhee switches to pocket trumpet, first riding the intense percussive waves that the drummer creates, then slowing down to bird-like (or is it ghost-like?) fluttering, while Nilssen-Love switches to brushes in reaction. "Acts Of Time" brings the most controlled demonstration of the saxophonist's incredible skill, blowing high sustained overtone sounds, barely touching upon the silence at first, then increasing the intensity for some heart-piercing wailing, supported by thundering drumming. And the treat goes on and on. It must also be noted that the quality of the recording is excellent too, creating a very intimate feeling, as if both artists were playing next to you. Free, creative, open and disciplined : I love it. Here is another nice album which almost went unnoticed to me, and one that went probably below many potentially interested people's radar screen. Percussionist Warren Smith assembled a band of like-minded spirits for some fully improvised music built around concepts and visions that Smith shared with his fellow musicians, visions ranging from Duke Ellington to animals free in their natural element, geographic locations and the like. 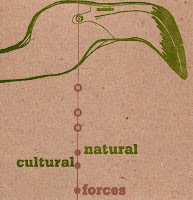 The musicians try to evoke these natural and cultural forces musically, in a full band, duo or solo settings. Apart from Smith on a variety of percussion, Tom Abbs plays bass, Andrew Lamb sax and Mark Taylor French horn. Throughout the disc the music evolves too, from the full band in the long first track, over a sax/drums duet on the second, a french horn/percussion duet on the third, a bass/percussion duet on the fourth, with the last two tracks being just solo percussion. The first track is an impressive band improvisation, which is excellent apart from the silly sounds at the beginning, with the sax and the french horn circling slowly around each other, while Smith supports brilliantly, highly energetic and full of little ideas, and Abbs' subtle bass acting as the fourth side of the pyramid. On the sax duet, Lamb works long in the highest tones of the instrument, coming down to earth again halfway the track, as the flight of the flamingo would suggest. My favorite piece is "Taurus At Pasture", on which the solemn tones of the french horn are in shrill contrast to the joyfulness of Smith's vibes. On "Epicenter", both percussion and bass remain in the absolute low ends of their instruments, with sparse sounds and lots of openness and silences, creating a rare sense of musical gravity and heaviness, again in contrast to the limited instrumentation. Apart from the already minimalist approach of Smith's music itself, listening to the whole album in one go, increases this feeling of reduction of music to its basic core essence : the last-but-one track brings a percussion and timpani ode to Duke Ellington, in a very sober and creative way and the last track is even more reductive, bringing just percussion sounds, devoid of rhythm almost, like raindrops falling down on leaves, an image which came to mind before I knew what the title "El Yunque" meant, which says a lot about the power of Smith's evocations. Music as creative as it is clever and deep. This is the third release of the William Parker Quartet, consisting of Rob Brown on alto, Lewis Barnes on trumpet, Hamid Drake on drums and the leader on bass. The two previous albums "O'Neal's Porch" (of which I have a spare copy in case something goes wrong with the first one) and the live record "Sound Unity", both get a 5-star rating (in my pre-blog personal list of all records I ever listened to). William Parker has many bands and many styles of modern jazz, ranging from intimate world music to avant-garde big band, with in between vocal jazz, free jazz, and many others. This quartet is without a doubt one of the best in my opinion, because of its strong musicianship, its powerful freedom that is anchored in blues and traditional jazz, and which is, above all, so deeply emotional. 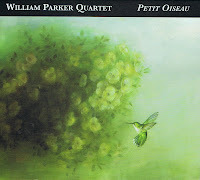 The title, "Petit Oiseau" refers to a tone poem by William Parker about a little bird that is born without wings, and his mother tells him that he has to learn to fly from within, which he does successfully and he flies higher than any other bird. The band brings their usual wonderful combination of powerful and rhythmic vamps, rhythm and tempo changes with strong melodies and long expressive soloing. Yet in contrast to their previous releases, there is a much stronger mainstream base here, with clear themes, played in unison by the horns. To me, personally, I prefer the previous albums of this band, because they are more direct and less polished than this one. The higher refinement creates a little more distance between performer and listener, at least this listener likes it a little rawer. The album is bookended by two long tracks, the first a suite, with various themes and rhythms, the last one a long and sad tribute to trumpeter Alan Shorter. The second track "Talap's Theme" is inspired by the Sami people of northern Scandinavia, but the song's basic structure, rhythm and call-and-response theme sounds almost African. Other influences emerge too : "Dust From A Mountain" is world music, with just Parker on cedar flute and Drake on frame drums in the first half of the piece, and "Malachi's Mode" has Afro-Carribean influences and is probably the album's most joyous track. This is by all means an excellent album, one which is highly accessible and should, let's hope it, offer the William Parker Quartet the wider audience it deserves. There is something about modern Scandinavian jazz which makes it exceptional. Regardless of the genre, it is often creative, with musical vision and style. With 'style' I mean an adult music-for-music's sake kind of approach, and this album is another great example of that. Maria Kannegaard's band consists of herself on piano, Håkon Kornstad on tenor sax, Ole Morten Vågan on bass and Håkon Mjåset Johansen on drums. The music is structured and has clear themes, but they move each track just over the edge of newness, making it sound odd, fresh and very captivating. The rhythms become strange, the interplay bizarre, as on "Av Veien" with a piano that keeps on thundering the same chords over a wild bass and percussion for a long time, until the whole thing is sucked up by the main unison theme again, which is in itself a weird combination of light-footedness (think of the music accompanying a mouse on tiptoe in a cartoon), with a menacing undertone. "Ruslende" brings a magnificent example of how to build musical tension, with sparse romantic piano notes introducing a barely audible whispering monotone sax, supported by deep bass tones and accentuating small percussion, and a short mournful arco bass moment suddenly leads to an almost joyful tune, a big part past halfway the track. Other tracks seem more straightforward on the surface, but still have sufficient complexities to keep the attention going with repeated listens. Even the two "ballads" draw from the rich romanticism of piano jazz, but again, the great interplay lifts it a little higher, and especially Kornstad's sax-playing is excellent on both tracks, keeping the performance far away from cheap sentimentalism. Kannegaard herself is a great pianist, showcasing her skills in the long "Hit Og Dit", which starts with a long solo piano intro, moody and dark, but again spirits lift when a tune emerges from the right hand, inviting the sax to join, and the rest of the band, for an odd-metred exploration of the intro, with the sax setting the rhythm, evolving back into slow melancholy. 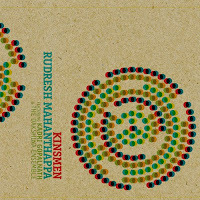 "Förste Vake" has the same bizarre approach as "Ruslende" with the arco bass and piano playing an Chinese-sounding scale, while Kornstad explores the deeper sound regions of the horn: an eery combination. In short, a strong compositional record, rooted in tradition with a more than modernistic approach, unafraid to create paradoxical clashes of mood, themes and sound explorations. Fresh and daring. A creative album by a great band. Listen and download from Moserobie. 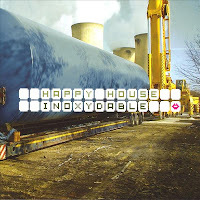 Happy House is a French band led by guitarist Olivier Benoit, with Julien Favreuille on sax, Nicolas Mahieux on bass and Jean-Luc Landsweerdt on drums. Their rock-influenced jazz is very modern, very creative and unlike many fusion : the music has incredible strong focus and emotional expressiveness. The quality of the band is that they join fragility with explosiveness, control with boundless possibilities, subtlety with a raw punk-attitude. The band was created more than 15 years ago, and started out much more in a free jazz environment, but just to take everyone by surprise, the band now shifted its approach to very composed and often complex pieces, with lots of rhythm and mood changes, but without losing the directness of jazz improvisation or of rock music. Dark, angry and sentimental, and still maintaining coherence, not bad ... And the fact that these four guys have played together for a while can also be heard. Nice! Hi, just in case you had missed my review of Nuts - L'Atelier Tampon Ramier which I gave a 5 star rating is NOW available for download at Sans Bruit : one bass, two trumpets, two drums. Great music!